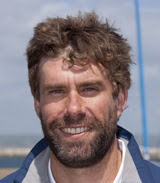 We are delighted to announce our special guest: Iain Percy, double Olympic gold medalist, multiple world champion, team manager and tactician of the Artemis Racing America’s Cup team and founder and trustee of the Andrew Simpson Foundation. Music later on from our very own in-house band led by Andy “Bonesy” Bones. Booking and payment is via WebCollect. Members and partners only, numbers limited to 116.
welcome drink, canapés, two course meal, coffee. To be held on Saturday 11th November 18:45 for 19:15 at the sailing club. (please note this is a change from the date published in the paper calendar).